The New Valley Governorate is one of the largest governorates in Egypt with an area of about 4400 km2, equivalent to 44% of the total area of the Arab Republic of Egypt and 66% of the Western Sahara. The groundwater is the only available water resource for all purposes (drinking, industry, agriculture). The agricultural sector is considered to be the most important productive sector in the economic structure of the governorate. Due to the importance of the wheat crop as a strategic crop used in human food, it is considered a source of animal nutrition. It is one of the most important field crops cultivated in the governorate. The area is about 158.8 thousand feddans in the 2015/2016 season. Of the total area cultivated with winter field crops. The problem of research was that although the New Valley Governorate is characterized by the availability of arable land of about 3.3 million feddans, of which about 158.8 thousand feddans are actually cultivated, In addition to the use of traditional irrigation methods and the consequent depletion of this resource. In addition, the main factor in agricultural exploitation was the water and not the land, which led to a decrease in the quantity of irrigated crops for arable crops. The research aimed at shedding light on the economics of wheat production in the New Valley governorate as one of the most important for field crops and maintain that using deep groundwater and surface using modern and traditional irrigation methods, and by studying the effect of different groundwater source and method of irrigation on the efficiency of the use of indicators alone water for the cultivation of this crop. 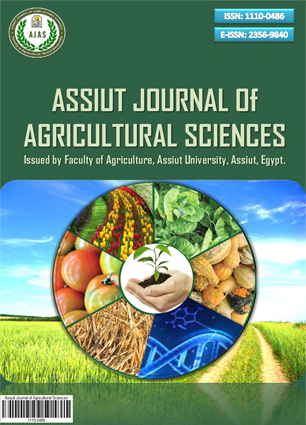 The results of the research showed that the quantity of the main output of the wheat crop reached a maximum of 16.77 ardab. Irrigation in surface wells (spraying) while the irrigation system in the two wells together(irrigation by flooding) reached 12.15 ardab. The secondary yield of the wheat crop was the lowest in the Irrigation in surface wells (spraying irrigation) 9.88 load, while the surface irrigation system (Irrigation by flooding) was about 5.65 load. As a result, there were statistically significant differences in irrigation water unit productivity, net revenue from water unit, irrigation unit cost, To produce the output unit, the ratio of irrigation costs to total costs, where a Wheat cultivation using surface wells (spraying irrigation) came first in terms of productivity of the water unit, while wheat cultivation using deep wells (irrigation by flooding) came in first place in terms of net revenue from the water unit, and wheat cultivation using the two wells together (Irrigation by flooding) was ranked first in terms of the cost of irrigating the production unit. In terms of quantity of water needed to produce the output unit, wheat cultivation using both wells (irrigation by flooding) came first, while wheat cultivation using both wells the first place in terms of proportion of the cost in irrigation for total costs. تمتاز محافظة الوادی الجدید بتوافر الأراضی الصالحة للزراعة والتی تبلغ حوالی 3.3 ملیون فدان یزرع منها فعلیاً حوالی 158.8 ألف فدان, إلا إن محدودیة الموارد المائیة بالمحافظة وعدم تجددها وظهور بعض الدلالات على بدء نضوب الخزان الجوفی ببعض مناطق السحب کالواحات الخارجة لزیادة معدل هبوط مناسیب المیاه الجوفیة من 5 - 15 سنتیمتر، فی العام وترک الحریة للمزارعین لحفر الآبار السطحیة, بالإضافة إلى استخدام أسالیب الری التقلیدیة وما یترتب علیه من استنزاف لهذا المورد الحیوی, جعل العامل الأساسی فی الاستغلال الزراعی هو المیاه ولیس الأرض (), الأمر الذی أدى إلى انخفاض کمیه الاراضى المنزرعة بالنسبة الى الاراضى الصالحة للزراعة. یستهدف البحث إلقاء الضوء على اقتصادیات إنتاج محصول القمح فی محافظة الوادی الجدید کأحد أهم المحاصیل الحقلیة بالمحافظة وذلک بأستخدام المیاه الجوفیة العمیقة والسطحیة وباستخدام طرق الری الحدیثة والتقلیدیة, وذلک من خلال دراسة أثر اختلاف مصدر المیاه الجوفیة وطریقه الری على مؤشرات کفاءة إستخدام وحده المیاه لزراعة هذا المحصول. اعتمدت الدراسة على أسلوبی التحلیل الاقتصادی الوصفی والکمی ومن أهمها العرض الجدولی والنسب المئویة والمتوسطات الحسابیة, بالإضافة إلى تحلیل التباین فی اتجاه واحد, هذا فضلاً عن استخدام بعض مؤشرات کفاءة وحدة المیاه لمحصول القمح بمحافظة الوادی الجدید, کما تم الاستعانة بأحد الاختبارات البعدیة وهو اختبار دانکان لاختبار المدى المتعدد.